I am a big fan of any energy efficient green building construction method. 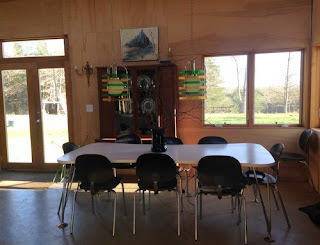 So I loved reading about the newest Living Building - an environmental education center! 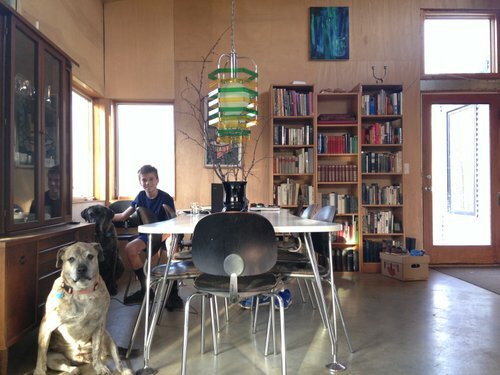 So what IS a Living Building, you say? You can learn more here but basically it is a net zero building but with more tenants that take into consideration not just the building itself but the community that surrounds it. Unfortunately, because we live in a very rural area, our own passive solar net zero prefab house could never be considered because one of the imperatives is that the site has "Human Powered Living" which means NO CARS. I mean, I love my horses and Amish neighbors, and try to produce as much of our own food as we can but our closest grocery store is 20 miles away soooooooooooo I NEED MY CAR. "The intent of the place petal is to restore a building’s and its inhabitants’ relationship with nature. It encourages designers to build compact, connected communities and to invite natural systems back into urban places. The challenge asks designers to design projects with humans in mind, rather than automobiles. How would we design our homes, offices and communities if we relied a little more on human-powered transportation and public transit? In addition, the challenge asks that landscape designs emulate the functions of indigenous ecosystems — not copy them directly but attempt to mimic their ecosystem services. For example, providing habitats for local bird populations could be one ecosystem service, as could capturing and treating rainwater." Again, I could get an Amish buggy like my neighbors but I don't think that's what the Living Building peeps have in mind... but we do have PLENTY o' NATURE, here! I love how they ask to work *with* natural ecosystems instead of fighting against them (think: all those developers who drain wetlands to build condos, for example!). And we all know how key walkability / carless mobility is. Well we do gather our rainwater onsite and treat it through our WISY system into potable water. We used to have a composting toilet, but the solution did not ideally work in a tight envelope home; now we flush our energy efficient toilet with the dishwater from our sink, therefore not wasting otherwise potable water. "Since capturing and treating rainwater is not legal in all places, advocacy is a major part of accomplishing this petal’s requirements. There are great regulatory success stories that have come out of Living Building Challenge projects as a result of advocacy on the part of project teams to bring codes up-to-date with current technology." Well we meet that, easy, as our house is 100% solar! What are they, hippies? I LOVE IT. I wish Living Buildings had existed before someone thought it was a good idea to build my childhood middle school- heavy concrete with NO WINDOWS because they thought they would distract us. just looking at this building? "First, in living buildings all regularly occupied spaces must have access to fresh air, daylight and operable windows. Second, a healthy interior environment and good air quality are required." Daylighting is so important for one's mental state, as is indoor air quality is for one's physical state. Too bad so many schools have the opposite environment. Well, SIP (structural insulated panels) meets the energy efficiency criteria but certainly rammed earth / cobb are natural. You can learn more about the SIP, here. 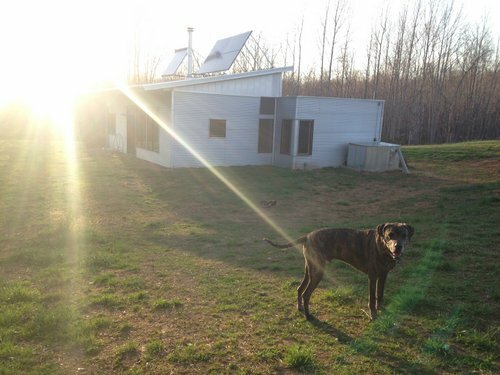 Our architects designed each prefab's designs not only for passive solar but to minimize waste in the fit of the structural insulated panels. Each homeowner can make the best environmentally-friendly line item choices in how they finish their home- for example, we reused a college basketball court to line our interior walls instead of using drywall. Of course our designs meet international code standards. "The equity petal challenges some traditional views about private property. To enable universal access to nature, a living building must consider its neighbors and, for instance, be built to a height that still allows for a neighbor’s access to sunlight. Living buildings also agree not to expose a neighbor to air pollution or noxious emissions, or to restrict public access to natural waterways." At our own passive solar net zero modern prefab house we have finally finished fencing! The equines are thrilled! With fencing done, we could finally relax a little, and just in time, for there was a fundraiser to benefit victims of the recent tornado at lovely Evergreen Lavender Farm. Bluegrass, BBQ, fields of lavender... and great friends with whom to gather! They raised about $3,000 via raffle tickets for this quilt! Well, we're off to mow fencelines and groom shaggy winter-coat-is-shedding equines. I was trying to take a picture but he needed a hug. I have been enjoying zucchini instead of (or mixing half and half) pasta. 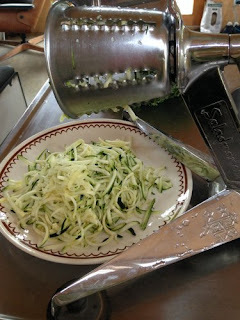 What I love about zucchini vs. butternut squash as a pasta replacement is it TASTES LIKE PASTA, as in, it has no taste! Just shred it raw, mix in some sauce, and call it a day! I used to try and try to make myself like butternut squash as "pasta." I'd bake it, scrape it, glop that stringy mess on a plate and disdainfully choke it down. So when someone recommended raw zucchini, I fully expected it to be a similar experience. I am now planting zucchini I like it so much! And a busy off grid life, you can't beat the ease of raw food! I can just heat the sauce in my solar cooker and serve it whenever I'm ready.